The name First XV Performance comes from my rugby background. If you play rugby for any team, you want to be named to the first 15 players put on the field (or pitch). First XV Performance is about getting on the starting team, finishing the race, keeping up with the grand-kids and simply moving better in life. 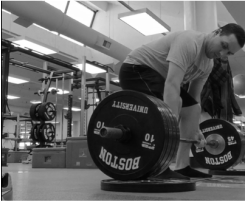 ﻿I am a Certified Strength and Conditioning Specialist (CSCS) through the National Strength and Conditioning Association (NSCA) and graduated from the University of Maine, Orono with a Bachelors in Kinesiology concentrating in Exercise Science. In 2012, I moved from my hometown of Portland, Maine to Boston. The rest as they say is history (or history in the making?). Working as an intern with a nationally ranked men's hockey team at Boston University was one of the highlights of my career. I have also interned at OA Parisi Speed School in Maine, and have completed courses with both Precision Nutrition & USA Weightlifting. I am a bit of a sports nut, and when I'm not picking up heavy things I play rugby for Boston Rugby Football Club and coach Rugby at Brookline High School.